An Amtrak train was involved in a crash with a truck in Halifax County, North Carolina, forcing the derailment of the passenger train and sending about 55 passengers to area hospitals. 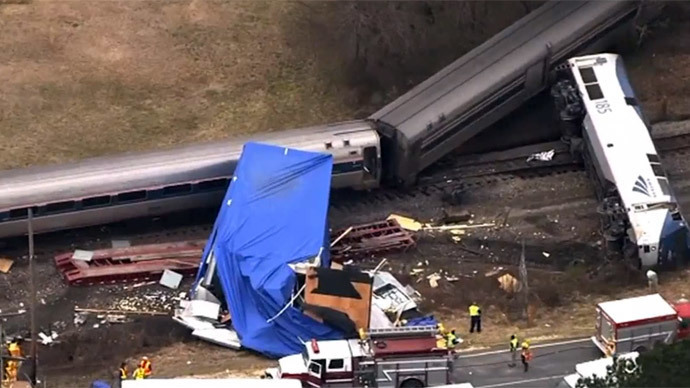 The incident occurred on Monday afternoon just south of the state’s border with Virginia, when a northbound Amtrak train collided with a tractor-trailer that had apparently become stuck at an intersection near US Highway 301, authorities told WRAL News. Photographs reportedly from the scene of the crash show at least one derailed train car, and area law enforcement say as many as three cars may have come off the tracks. According to the AP, 54 passengers were taken to hospitals with minor injuries, and one other individual was hurt more seriously, though details are unavailable. Passenger Ted Camarata told WRAL that the train was the Amtrak Carolinian, traveling from Raleigh, NC to Philadelphia, Pennsylvania. "There was a massive jerk and we were kind of thrown forward a little bit, and the train came to a sudden stop," another passenger, Charlotte Story, told the news network. "I couldn't tell you if it was trying to slow down or not. There was no whistle. It came completely out of the blue." Eyewitness Amber Keeter told WRAL that she was behind the tractor-trailer before the crash occurred, and believes the truck had been trying to negotiate a turn near the intersection for around 15 minutes before the collision. "It wasn't so much they got stuck," she said. "They could not make the turn. They were too long." Halifax County Sheriff Wes Tripp told The Daily Herald that injuries were reported, but were not believed to be life-threatening. "We are relieved that there are no fatalities reported at this time, and our thoughts and prayers are with those who were injured," Transportation Secretary Tony Tata said in a statement offered to WRAL. "Safety is always our top priority, and we continue to urge everyone to use extreme caution and stay alert when crossing our railroad tracks." Later in the day, the Associated Press reported that 55 people had been injured, citing officials. BREAKING: Officials: 40 hurt when Amtrak train collides with truck; no life-threatening injuries. According to the AP, officials with the state’s Department of Transportation confirmed on Monday afternoon that 25 people had been taken to Halifax Memorial Hospital by bus and 15 by ambulance after the collision, and that none of the injuries appeared to be life-threatening.